Music is the organization of noise. Prison – a form of political organization for the United States, at least since the beginning of the 19th century – has, in all its cold, hard cruelty, produced its own form of music (or “organized noise”). This music – all of its songs from, or about, prisons and prison life – helps trace the history of human containment sonically. Prison music awakens us to the possibilities of sonic and political escape from incarceration. The beginnings of prison music in the United States can be traced to the War of 1812. A poet named Francis Scott Key met with British officers aboard a ship off the coast of Maryland to negotiate the release of American prisoners. He was detained and from his dank cell on that ship, Key watched the Battle of Baltimore at Fort McHenry and reported at dawn to the prisoners below deck that he was still able to see the American flag waving. He chronicled the experience in a poem titled, In Defence of Fort McHenry, which he later put to music. Eventually, the song came to be known as The Star-Spangled Banner. In 1889, the Secretary of the Navy designated “The Star Spangled Banner” as the official tune to be played at the raising of the U.S. flag, and in 1916 the song was declared the national anthem of the United States. The relationship between prison and music in the United States can be heard most clearly through Black soundings of voice, tools, instruments and technology. It is a sonic protest against imprisonment, even as prison labor is being performed. It is simultaneous containment and escape. Prison is a necessary function of white supremacist patriarchal capitalism – a warehousing of surplus bodies for exploitation or elimination. Prison music is a documentation of this process. Listening to, and perhaps playing, prison music is our attempt to hear ourselves survive within these dehumanizing systems. 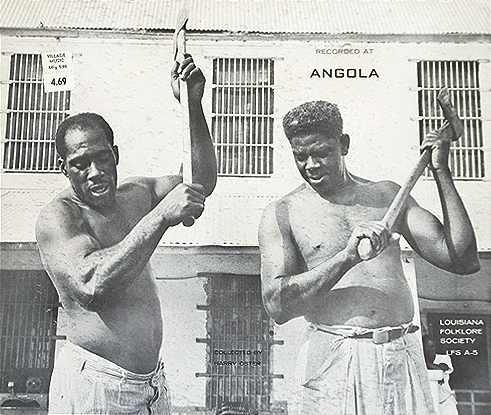 Prison inmates were put to work in the various institutions where they were housed. 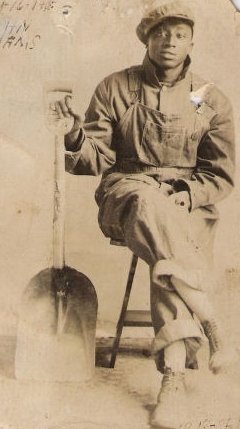 Working in the cotton or tobacco fields, road and chain gangs, or clearing forests, there were different types of songs for each type of labor. A team would choose a leader as their singer, usually a man with a clear voice who could easily be heard. Proper singing wasn’t necessary but the volume of the voice was. Sometimes, teams or crews of as many as eight men were put to work cutting a tree down, with each member of that team supplied an axe. The reason the work song was so important to the team was simple; with eight men swinging individual axes at the same target, without a rhythm to work by, havoc would be the natural outcome. In an eight man team, four men would follow the lead voice on the downbeat, swinging their axes into the base of a tree, the opposite team would strike the tree on the next downbeat. 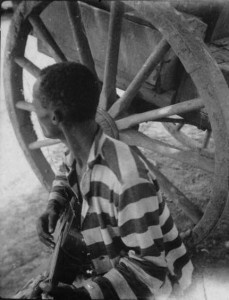 These songs were often sang in coded language and expressed the prisoners’ – many of them former slaves – feelings of re-enslavement after Emancipation. These songs of the Steam Age and beyond represent testimonials about the injustice of the criminal legal system for Black people. The theme of wrongful imprisonment and mistreatment of prisoners permeates many prison songs, which have become the foundation of what we now know as the Blues and even today, songs about the hardships of prison life are commonly found in Hip-Hop. R&B / Hip-Hop star, Akon, had written for mega stars, including the King of Pop – Michael Jackson – but his own career as a performer did not take off until the release of Locked Up, his song about his time behind bars. In the Steamfunk feature film, Rite of Passage, we further examine prison songs and the effect those songs have on the legendary steel drivin’ man, John Henry. What type of music provides escape for you? Which songs set you free? Posted by Balogun on May 23, 2013 in Afrofuturism, Film, Historical Fiction, Street Lit, Urban Fiction and tagged john henry, rite of passage, steamfunk, steampunk. I am always amazed with how our people use music. It’s expresses our sorrow, gives us hope, provides instruction, helps us to keep time when working. So many things. I’m an old school rhythm and blues type of person, to answer your last question 🙂 . You have definitely carved a niche for yourself. I can see those music genres being an accent for Steamfunk.